Centara Hotel & Convention Centre Khon Kaen in Thailand will open its doors to events business at the end of this month (May). Owned by the Khon Kaen Buri Company, the venue has been completed following a BAHT 1.8bn (£36m) development in response to demand from the C&I sector. 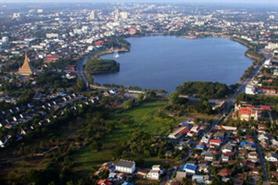 The 12-storey venue has 196 rooms and becomes the largest hotel-convention centre in Khon Kaen. The Khon Kaen Convention Hall can hold up to 2,000 attendees seated theatre-style and 2,500 for a reception, while the Prachasamosorn Ballroom has capacity for 700 delegates theatre-style and 350 for banquets. The convention hall has access to an outdoor swimming pool, which is surrounded by a landscaped garden suitable for cocktail receptions and hosted events. There are also six meeting rooms for breakout sessions and a spa. Thirayuth Chirathivat, chief executive of chief executive of Centara Hotels & Resorts, said: "We are delighted to announce the opening of this magnificent hotel and convention centre in Khon Kaen, and believe it is perfect in terms of both facilities and location to meet the enormous regional growth in the meetings, conventions and exhibitions sector."